The Ministerial Planning Team provides strategic and diplomatic oversight for the annual Mission Innovation Ministerial. 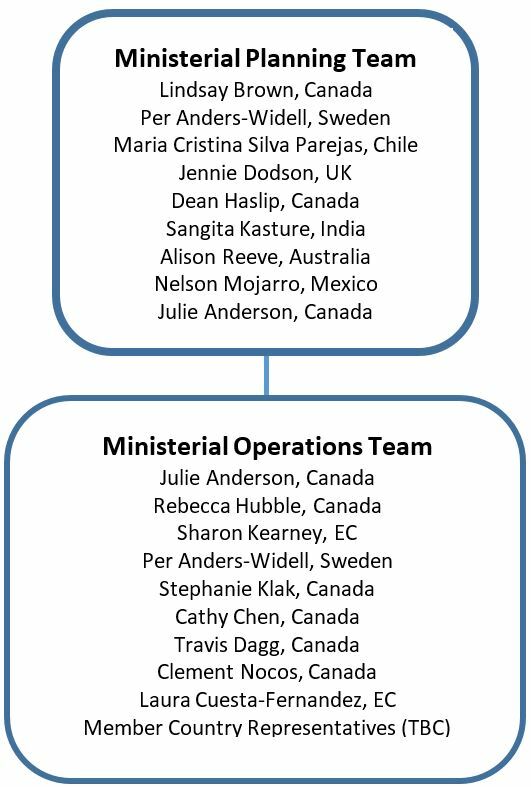 The team is led by a Chair (put forward by the host country), and reports directly to the Mission Innovation Steering Committee (MISC). The MPT is supported by a Ministerial Operations Team (MOT), also led by the host country. 1. Collaboration: Working across all MI subgroups, and with the Steering Committee, Secretariat, and external partners, as well as the Clean Energy Ministerial (CEM) Secretariat. 2. Transparency: facilitating open, two-way dialogue and information sharing with stakeholders. 3. Inclusivity: ensuring that all members are consulted in the planning process. The Ministerial Planning Team works closely with all Mission Innovation subgroups and workstreams, ensuring alignment between the Ministerial programme and ongoing activities and initiatives. Leading up to the annual Ministerial, there are numerous opportunities for engagement with member countries, stakeholders and partners in the formation and planning of the event. Additionally, a dedicated preparatory meeting is held as part of the annual all member gathering, ensuring all members have an opportunity to feed into the agenda for the event.